Forms are an essential part of your website, but with so many options how can you choose the right form for you? This guide will give you a clear idea about how to combine forms and Elementor. There are many uses for forms. Whether you want to add a contact form to your site, accept online bookings, let your visitors upload files, or you need to publish an online calculator or quote form, WordPress forms is a topic web professionals need to contend with. However, with so many great (and not so great) options out there, how should you go about adding forms to your Elementor page designs? By the end of this guide, you’ll have a clear idea of whether the core Elementor form functionality is enough for your project, or if you’ll need to install one of the free or paid form tools covered in this article. To help you decide how to add forms to Elementor, you must first be sure which features you need and which properties are important to you. Some points to consider while reading this guide include whether you’re prepared to invest in a premium tool or would rather use a free solution, and if you’re happy to rely on third-party extensions to add extra features. Useful form-related features include a good set of form fields, the ability to create multi-step or multi-page forms, forms integration with third-party services, and an ability to display and hide form fields using conditional logic. These features are all available from the best WordPress form plugins, although, with some, these features are reserved for paying users. It’s also worth pointing out that while you can easily add the forms from these plugins to your Elementor page designs, you can’t always customize their appearance with the Elementor visual editor. That is unless, you’re prepared to install a third-party add-on for Elementor, such as the free version of Elementor Essential Add-ons, which supports all of the forms covered in this guide. With that in mind, let’s get started and check out the best ways to add forms to pages created with Elementor. Let’s get started covering the different forms and their capabilities. First up, let’s take a look at the built-in form functionality of Elementor. 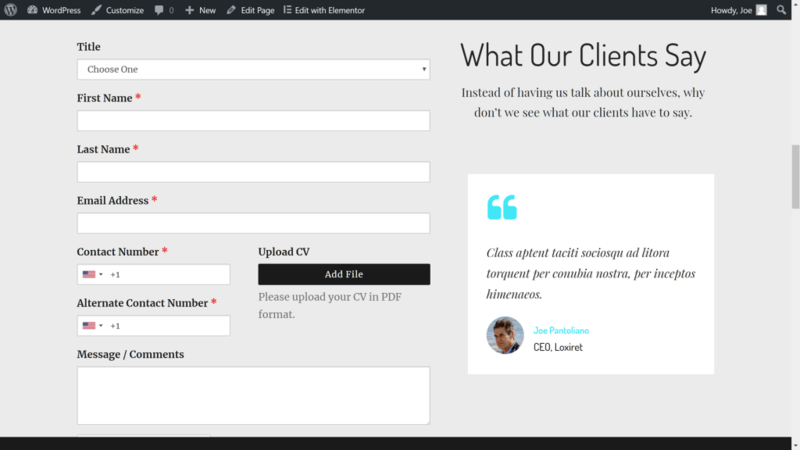 Elementor Pro users can add the Form module to their custom page designs. They can also use a selection of pre-designed page Templates and Blocks that include ready-made Forms. One of the highlights of Elementor is its intuitive interface, and thanks to this, you can easily create custom form designs — something that’s not possible with standalone WordPress form plugins. Not only that, but the Form module has some impressive form-related features that compare well to those found in the best premium WordPress form plugins available today. Furthermore, you can use the features of the Elementor visual interface to ensure your forms are mobile friendly. Thanks to the ability to define the properties of page elements based on what device the visitor is using, you can easily change the form field width, for example, for users viewing your site via smartphone. Now you no longer have to worry about mobile users being unable to access your forms. With a good selection of form field types, including checkboxes, file uploads, a password field, acceptance fields, date and time fields, HTML fields, hidden fields, and more, you can do a lot more than just create basic contact forms with Elementor Pro and its Form module. 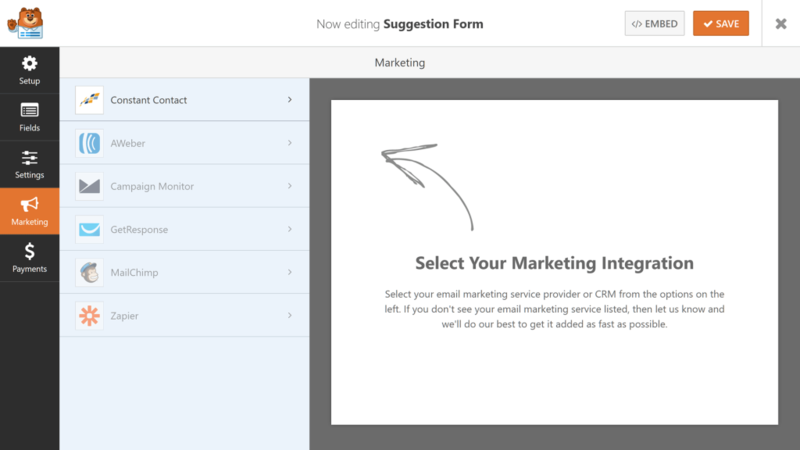 Any forms you create with Elementor can also be integrated with a range of email marketing services, including ActiveCampaign, ConvertKit, Drip, GetResponse, HubSpot, MailChimp, MailPoet, and SalesForce. You can also integrate Elementor forms with Zapier and then connect to any other services you might be using. Contact Form 7 is the most popular WordPress forms plugin with over 5 million active installations on websites around the world. When it comes to adding contact forms to a WordPress website, Contact Form 7 is widely recommended for its ease of use and simplicity. 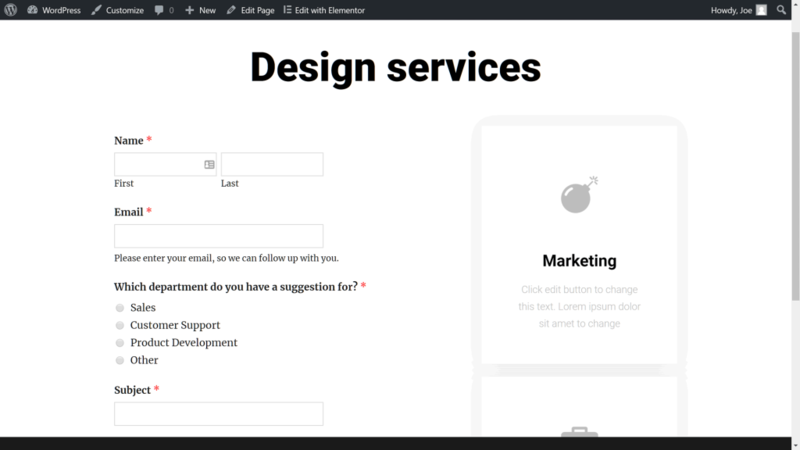 Thanks to a handful of free extensions that integrate Contact Form 7 with Elementor, any forms you create with this plugin can be quickly inserted into your page designs. Depending on your choice of theme, the forms take on the styling of your website. Although Contact Form 7 is a hugely popular plugin and is one of the fastest ways to add a contact form to a WordPress website, its feature list is limited. However, by using free third-party extensions, you can add the ability to create multi-step forms, work with conditional fields, and integrate Contact Form 7 with PayPal and Stripe as well as with email marketing services like MailChimp and AWeber. If you don’t mind assembling a collection of third-party add-ons and extensions, there’s a lot you can do with Contact Form 7 and Elementor, beyond the core functionality of this popular free forms plugin. Although compared to Elementor and its Form module, the interface for customizing the form designs is lacking. So with all of this in mind, you might find using a feature-rich WordPress forms plugin — like the ones we’re about to explore — with Elementor more satisfactory. 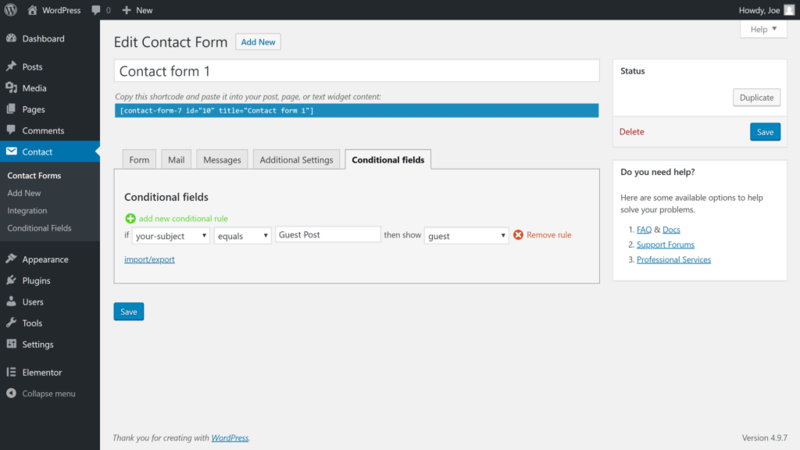 WPForms is a freemium WordPress forms plugin that can do much more than just add contact forms to a WordPress website. 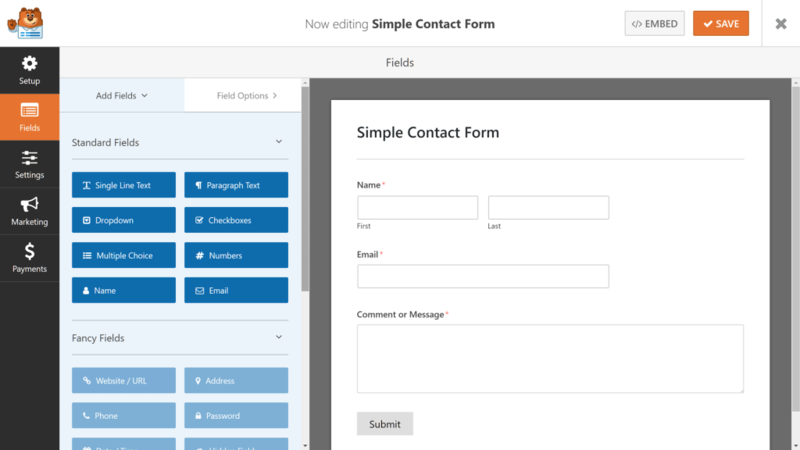 Unlike Contact Form 7, even the free version of WPForms includes a drag-and-drop builder that makes it easy to design custom forms for your website. If you’re already using Elementor, then the modern drag-and-drop interface of WPForms will be familiar. However, although the WPForms interface looks good, unlike Elementor, it isn’t a true front-end form builder. The work takes place in the back-end of your website, rather than directly on the page you’re adding the form to. Because of this, you don’t get the easy visual workflow that’s provided by Elementor and its Form module, where the design work takes place right in the page you’re adding the form to. 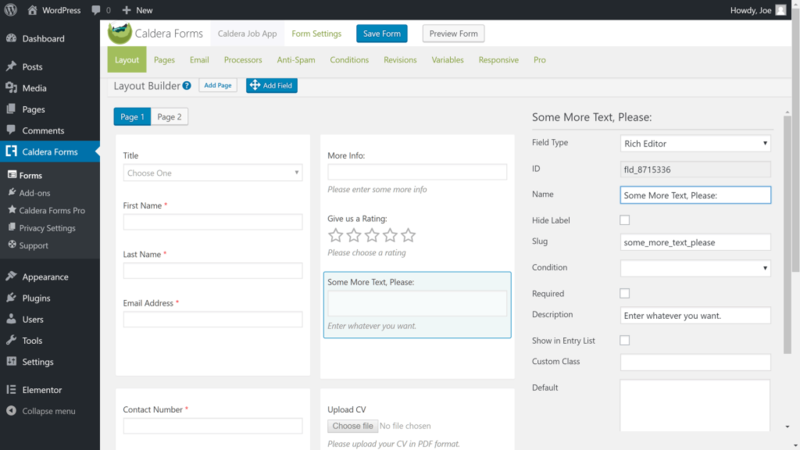 While the form builder interface is easy to use, the features of the free version of WPForms are lacking. 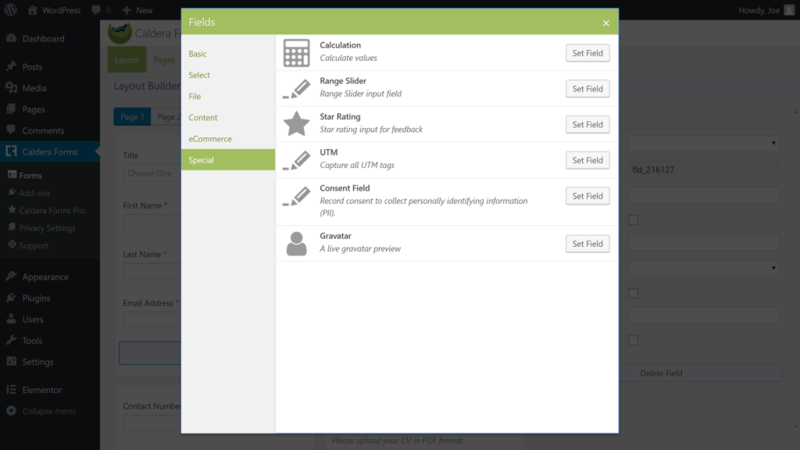 For example, the form field types of the free version are limited to just the basics. 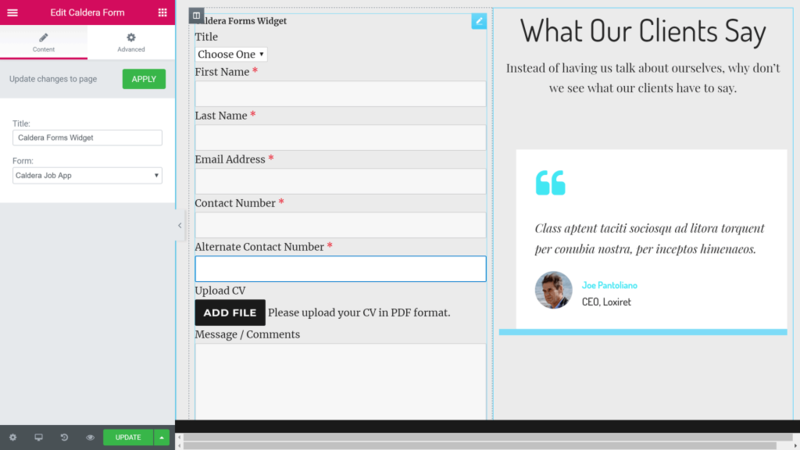 However, unlike Contact Form 7, WPForms does have more form templates than just an option for a contact form. This includes a basic newsletter sign up form and a suggestion form template. 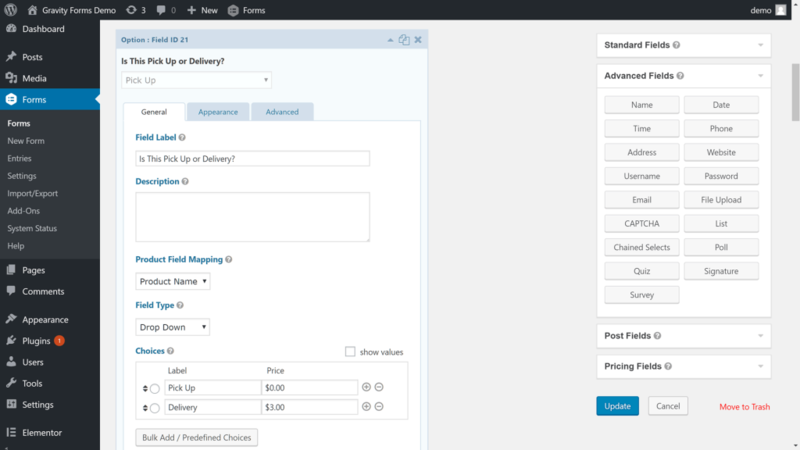 Although the free version of WPForms limits email marketing service integration to just Constant Contact and no others. When it comes to adding forms created with WPForms to pages designed with Elementor, the main option is using the WPForms widget. 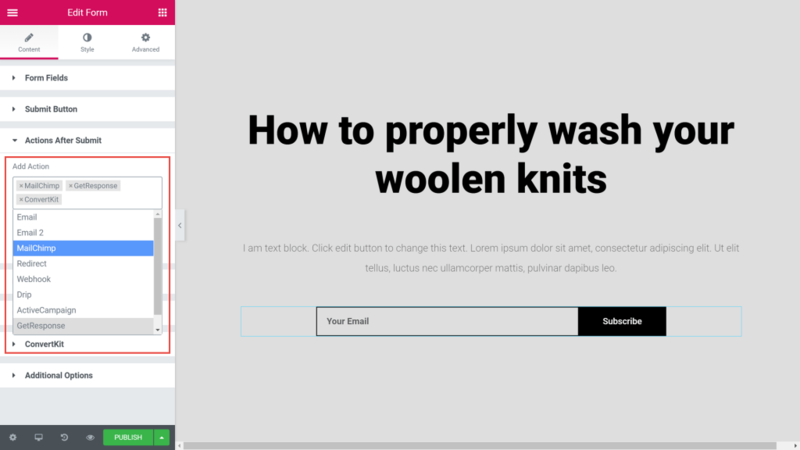 As Elementor lets you add any widgets that are active on your site to your custom content designs, the WPForms widget can be dragged and dropped right into your page layout. Then it’s just a matter of selecting which form you want to display from the drop-down menu on the WPForms widget. If you’re using a well-coded WordPress theme, the form will pick up the styling of the theme to help it integrate with the design of your site. Upgrading to the paid version of WPForms changes the situation completely. Not only can you add more types of fields to your forms, as well as integrate your forms with many of the best email marketing services, but you can also use features like conditional logic and multi-page form support to create advanced forms for your WordPress website. Other high-level features like PayPal and Stripe integration for accepting online payments through your forms can be enabled too, by upgrading to one of the WPForms paid plans. 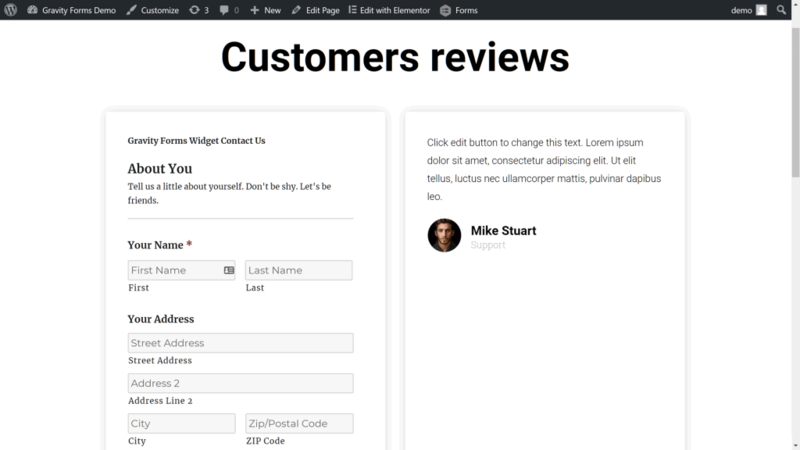 With a slick interface and a useful set of features — at least in the premium version — WPForms is a good WordPress forms plugin to use with Elementor. Unlocking all the premium features of WPForms isn’t cheap though, so it might not be for everyone. Gravity Forms is a well-established premium WordPress forms plugin that can be used to add almost any type of form to your website. The Gravity Forms feature list has been constantly growing over the years, making this possibly the most powerful forms plugin for WordPress websites. Features like conditional logic and multi-page forms are included as standard, and there are also over 30 form fields to make use of. However, while Gravity Forms has a drag-and-drop user interface, it isn’t quite as slick as the WPForms builder. Gravity Forms integrates with a range of third-party services including project management tools, email marketing services, communication tools, and payment processors including Stripe and PayPal. Again, Elementor’s ability to allow users to add any widgets that are active on their site to their custom page designs makes inserting forms created with Gravity Forms very straightforward. Although the Gravity Forms widget doesn’t display the actual form in the Elementor page builder, previewing or publishing your page makes the form visible and ready to receive data from your visitors. Like the other top 5 free and premium form plugins to use with Elementor, the forms from Gravity Forms take on the styling of your theme when published. Unfortunately, there’s no free version of Gravity Forms, however, there is an online demo you can try to see how this plugin works. 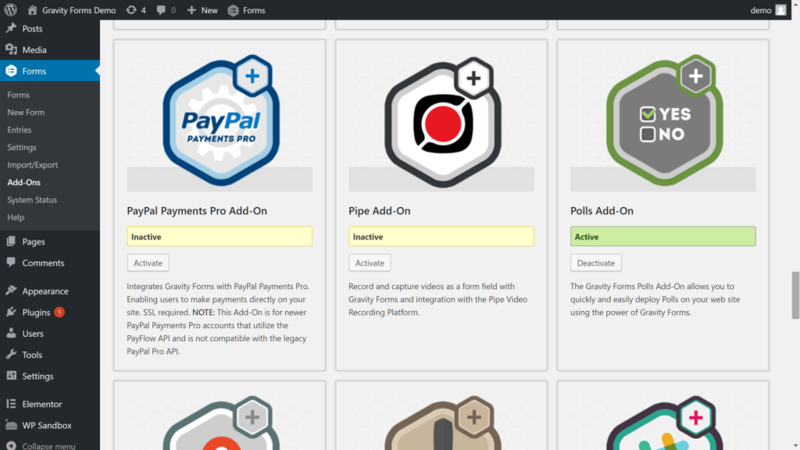 The full cost of the plugin will depend on which features and add-ons you want access to, with three pricing options to choose from. But when it comes to WordPress form plugin features and functionality, Gravity Forms is hard to beat. The free version of Caldera Forms is currently running on a respectable 100,000+ WordPress websites. Aside from the standard form fields, such as text fields and a range of different selectors, the free Caldera Forms plugin also has e-commerce credit card verification, star rating, and Gravatar live preview fields. 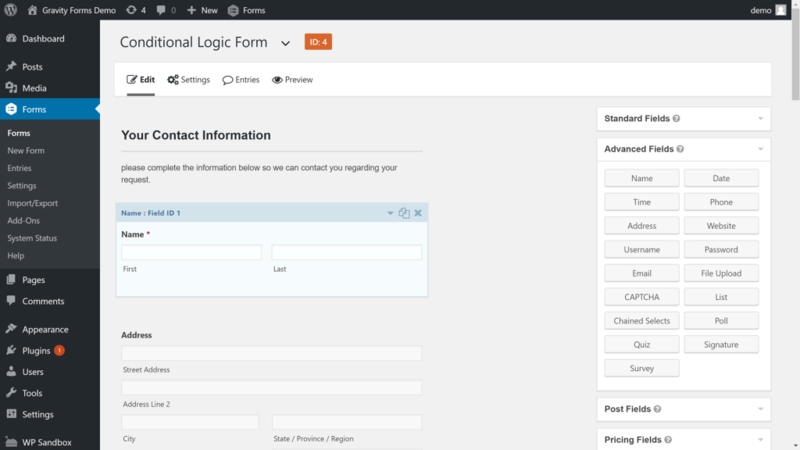 Users of the free version get access to conditional logic for controlling the visibility of form fields as well. 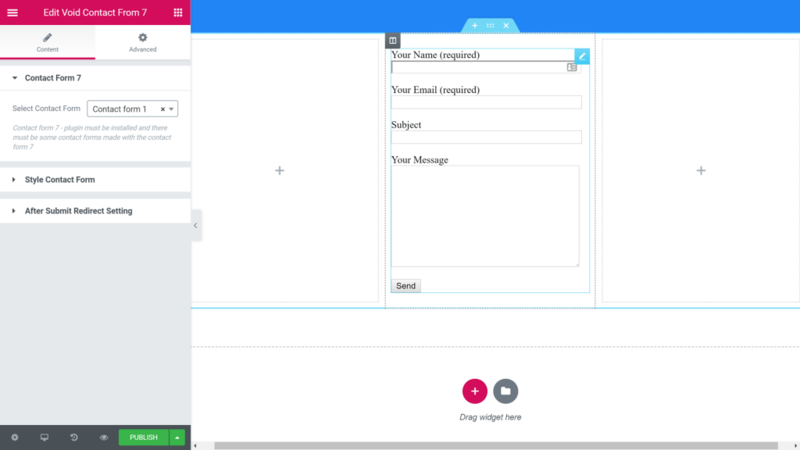 Setting up the forms is straightforward, thanks to the drag-and-drop interface. Again, like Gravity Forms, the UI doesn’t look as slick as WPForms or Elementor, but it is functional. A nice feature of the Caldera Forms builder is how easy it makes creating multi-column forms as well as multi-page forms, even when using the free version of the plugin. 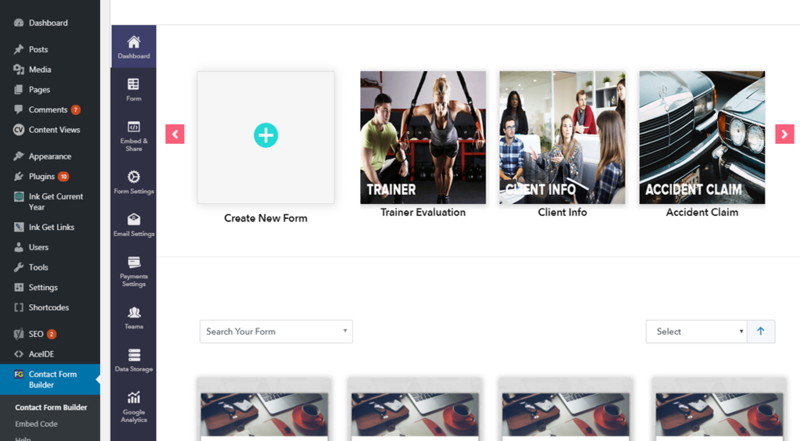 When you’re ready to add a form to your Elementor page design, you can simply drag and drop the Caldera Forms widget onto your layout. As is the case with the other top 5 free and premium forms to use with Elementor, you can also use the shortcode widget and paste in the shortcode for the form you wish to display. Once you preview the page, you should see that your form has taken on the formatting and styling of your theme. Although the free version of Caldera Forms has a competitive set of features, upgrading to the paid version unlocks extra functionality. This includes the integrations with email marketing services and payment processors, such as PayPal and Stripe. If you don’t want to invest in a forms plugin but would still like to use conditional formatting and multi-page forms in Elementor, the free version of Caldera Forms is a good choice. It’s easy to use, has some useful pre-built form templates, and if you do need the extra features, you can always upgrade at a later date. 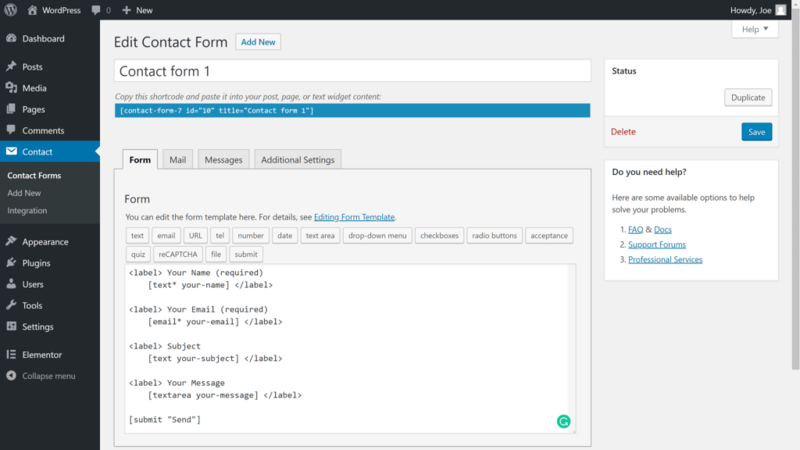 FormGet Contact Form is one of the most creatively designed WordPress form builder plugin. 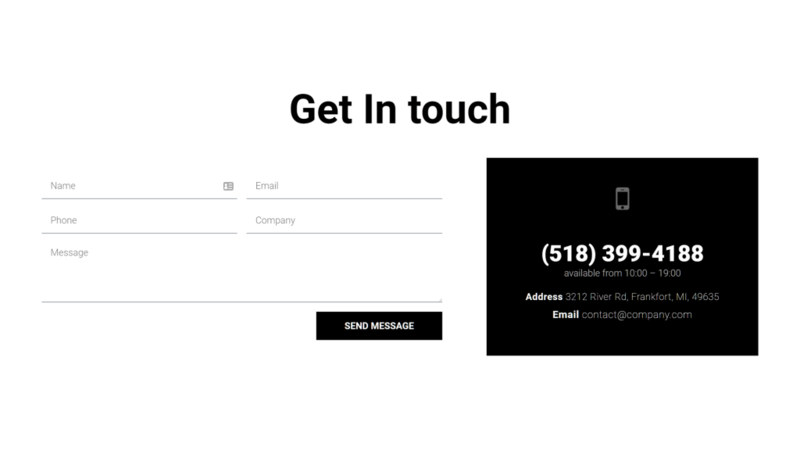 This contact form plugin has drag & drop functionality like Elementor that enables you to easily create & add a multilingual contact form on your website. By using this online form builder, you can create a variety of forms like payment form, product selling form, bug tracking, newsletter, survey, etc.. You can showcase any type of form on your website by simply pasting the tabbed widget code. The plugin provides you a unique URL for every contact form which you can share on any other platforms. Even, you can redirect users to any page/URL by using its redirect URL field. 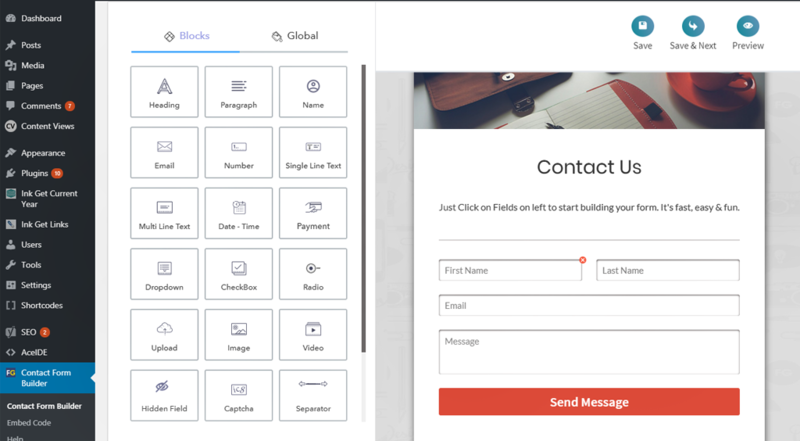 FormGet Contact Form allows users to upload files of different formats like jpg, zip, png, gif on your form.In fact, this contact form plugin is integrated with PayPal & Stripe through which webmasters can easily collect their payments. Moreover, this plugin contains the ability of multiple app integrations like AWeber, MailChimp, Constant Contact, GetResponse, etc. Further, this form builder plugin offers you a spam protection option through which you can add a captcha field on your form. The tool comprises with an ability to send a confirmation email to users whenever it receives a new entry.Furthermore, all the entries are stored regularly on the dashboard. With this advantage of store & backup, you can easily see all the messages & reply to users at the same time. Talking about its custom appearance, this contact form plugin allows you to perform a lot of styling operations like uploading the header image, background colors customization, etc. Finally, all the forms created using FormGet Contact Form are absolutely responsive in nature. It has all the essential elements that are required in a form builder like form field validation, form rebranding, logic forms, etc. As you can see, Elementor Pro has an excellent set of form features. Furthermore, you can also quickly add forms from the best WordPress plugins to your Elementor page designs. Despite some of the best premium form plugins in this guide being relatively pricey, it is possible to create advanced forms on a budget. Thanks to Contact Form 7 and its library of free third-party add-ons you can add many of the features from the best premium plugins, such as email marketing service and payment process integrations, as well as conditional fields and multi-page forms. If you’d rather choose an all-in-one form solution that has everything you need, instead of relying on a collection of third-party add-ons, then Gravity Forms, WPForms, and Caldera Forms all come highly recommended. Just be sure to check which plugin has the exact features you need. Checking out the free versions or online demos will also help you decide which one is right for you. Which WordPress forms plugin will you use with Elementor, or will the Form module suffice? Joe is a freelance writer who specializes in creating content for web designers, online business owners, and bloggers, especially those using WordPress. When he's not keeping up with the latest design trends and other developments from the online world, he's busy spending time practicing jiu-jitsu, learning to meditate, and figuring out how to take a good photo. I would go so far as to say that Gravity Forms is one of the most powerful WP plugins in general. It constantly gets updates though because it has half a billion moving parts at this point, which means there’s likely to be here’s and there’s that don’t work quite right. The reality is, for as powerful as it is, talking to thirty party services with built in functionality, taking payments, doing custom user registration or generating PDFs on the fly (through add-ons, that is), I’m so used to it that I always just used to push it on people even for regular contact forms, primarily because it was so reliable and customizable, but also because it has such a nice back end archiving, searching and screening messages and such. But I am not here to sell it. They all have their times and places, and it just got more costly to use CF. I actually just wanted to say, if you do already have it: as it relates to Elementor, this article mentions you can’t see a GF form in a preview. I’ve never done it that way. I paste the shortcode into the Text Editor or HTML widget and nothing comes up, except either after a few seconds or if I click away to another widget, I can see it just fine (and adding styles in Advanced > Custom CSS for that widget does affect it live for me to see the changes). Elementor’s own built-in forms plugin is great, because for 90% of the things my clients actually need a form for, it’s got it covered. I love the percentage width dropdown to make nice column layouts, and it’s even got anti-spam baked in. I kind of which there was a way to archive messages, but I suppose that starts to get outside of the scope of the plug-in (the only real non-page-building aspect of Elementor so far is things like option/settings/integrations, so one might worry that if you expand features for that part, then everything else starts to get its tentacles and feelers jutting outside into the rest of WordPress and then it’s defeated its own purpose of being lean and low overhead. Maybe someone can develop an add-on then, so it’s by choice if you can accept the risks/performance hits. FormidableForm is a really good contender here !! It is my choice for many years and projects. Here here! Formidable is our go-to forms plugin, sorry to see it overlooked in this post. Absolutely love Formidable Forms! I’ve been using it for years and it only gets better. Formidable is far better than Gravity Forms in terms of price (BY FAR!!) and the feature set with Formidable meets or beats Gravity. I really don’t see why it’s not listed here!! will Constant Contact/Mail Munch Plug-in work with Elementor? Thank you for this, I used to go through a lot of form builders. For most of my needs Elementor Has it covered. However, nowadays I settled for HappyForms plugin does virtually everything and it is completely free. Forms are great for collecting data but even more important in many applications is the display of that data. Gravity forms works seamlessly with Gravity View. I have successfully used the Gravity Forms and the Gravity View combination to display data on many Elementor sites. Some of these have been job postings that pop up and disappear at the closing date or various list of attendees at family reunions that sort by Family Branch. For those who are not coders Gravity View is a terrific option and it works well with Elementor. I will check it out – thanks! I have to give a big shout out to Formidable Forms. Best plugin and more than a forms plugin. Hi! I really love this feature because is very easy to manage and well sincronized with other plugins. The only thing that I am missing is the ability to create pop-ups for subscriptions, which is demostrated to be more powerful when an user click on a bottom to subscribe than to just enter email. It would be amazing to develop an integration with that or Elementor to develop it. The commercial plugins are expensive and recurring yearly. As such, I’ll be sticking with Contact Form 7. I am trying to use Elementor-Pro, which is a great tool. However, haven’t seen anywhere how to create a 3-layer drop-down menu within a section rather than on top menu. Can we do it? One thing missing from this otherwise great rundown is how the forms handle data storage and emails sent. For example, Contact Form 7 does not store anything. You have to use another plug-in to actually save the data. All it does is email the info to you. Even though I’m a coder, I found the field configurations and getting them to align with saving configurations to be a headache. Maybe I missed a feature? I’m using Ninja Forms right now. I like that free version saves the data and provides configurations for what gets emailed to you, emailed to the person filling out the form, what gets saved. The form building is separate from Elementor, but the resulting form works fine within Elementor Pro when placed via shortcode within a modal element. That said, looking at the other popular webform solutions is on my list, and what works with Elementor best is always a major consideration. Which of these forms can Elementor actually edit visually/aesthetically within the page? Problem with these forms, you need to be good at CSS to make it look good to your theme or page. I’m surprised Ninja Forms isn’t mentioned on the list, it’s great all around. Well, There is so much that can be done in forms and still stay simple but powerful. I really wish Elementor will add more advanced functionality to the Forms. Not expecting Elementor to develop GF like widget. It’s not even wanted. Contact form 7 is good plugin i used for elementor! Thanks for this tutorial! I think you missed another great plugin named “WeForms” by WeDevs. 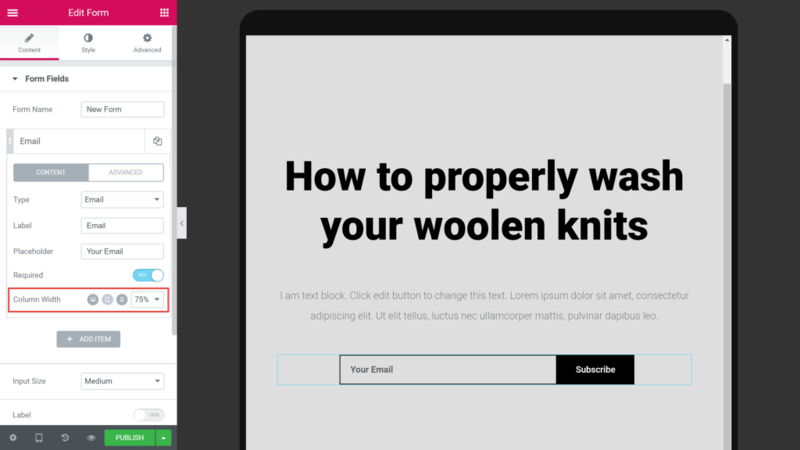 – Integration with Mailchimp/mailpoet so that it can double as an email signup form. Main point is to not slow down the website overall, and cut down a plugin by having both integration with newsletter sign up and contact form. At the moment I use contact form 7, however haven’t found a way to just have a ” Email” and ” Subscribe” button to actually sign a person up for the newsletter. Formidable Forms is great. I got it years ago and have a lifetime license. I used to be a Gravity Forms Kid, but for the price, FF is the way to go. when does the elementor form provide a calculation feature? Hi Andy, can you please explain which calculation? I could easily go with the standard Elementor form widget BUT…. Some one is typing this text on several lines somewhat like this here…. Nowadays, calculators are also the most popular. I would even say that they are in trend. For example, I combine forms with calculators and make form-calculations. Very useful thing, attracts customers and it is very convenient to receive applications. I do not make calculators manually, but collect through uCalc, since I don’t want to mess around with the code. Formidable is the best, please add a widget for it!